29 cm 152 p. : chiefly col. ill.
Multi-million-selling Asterix is much loved across the world, and there is no better way to enjoy the antics of our indomitable hero and his friends than in this great value gift edition omnibus of the first three stories. 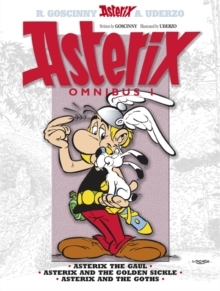 Collect all of the Asterix omnibuses to build the fabulous artwork across their spines! In ASTERIX THE GAUL, we join Asterix, Obelix and co. as they try to defend one small village in Gaul from the mighty legionaries of Rome who surround them. Disaster strikes the Gaulish village in ASTERIX AND THE GOLDEN SICKLE, as Getafix the druid breaks his golden sickle - which means no more magic potion... In ASTERIX AND THE GOTHS, Getafix is kidnapped by the Goths, so Asterix and Obelix have to ride to the rescue and save the day!A perfect gift for both keen Asterix fans and those who have yet to join his hilarious adventures.